Few animals are more problematic than the tiny African insect known to English speakers as the tsetse fly. This is the carrier of "sleeping sickness," an often deadly neurological illness in humans, as well as a disease that has killed millions of cattle, reshaping the landscape and economy in some parts of the continent. For generations, vedzimbahwe (the "Shona" people, builders of houses) and their African neighbors, assembled a significant store of ruzivo—knowledge—about mhesvi, their name for the tsetse fly. As MIT Associate Professor Clapperton Chakanetsa Mavhunga explains in a new book, this accumulation of local knowledge formed the basis for all subsequent efforts to control or destroy the tsetse fly and is an exemplary case of scientific knowledge being developed in Africa, by Africans. 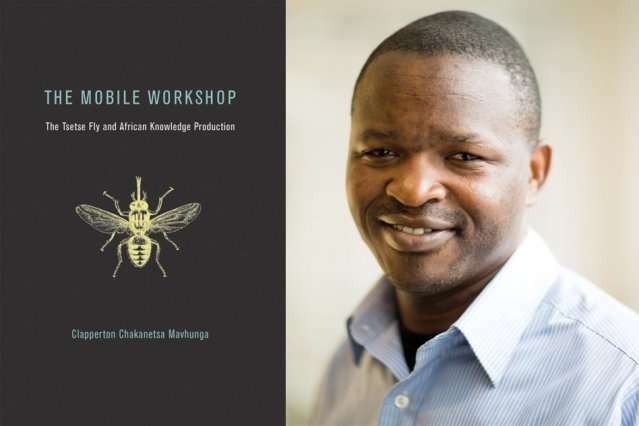 "Ruzivo and practices based on it were the foundation of what became science and means and ways of tsetse control," Mavhunga writes in "The Mobile Workshop: The Tsetse Fly and African Knowledge Production," recently published by the MIT Press. However, he notes, Europeans nonetheless dismissed Africans as being "only good at creating and peddling myths and legends." In fact, Africans developed a diverse set of practices to combat mhesvi. For example, they used late-season forest burning to expose mhesvi to predators; moved herds through mhesvi-infested stretches at night while the insect was inactive; strategically located their settlements to neutralize the insect's threat or turn it into a weapon against their human enemies; cleared bush and felled trees to create buffer zones between mhesvi-infested wildlife areas and human- and livestock-inhabited areas; and developed innoculations using live or dead mhesvi. Europeans appropriated many of these methods, or, at the very least, used their basic principles as starting points for what they then called "science." To understand how Africans learned about the intricacies of mhesvi, Mavhunga says it is important to consider the connections between the mobilities of the insect and those of larger animals, people, and the environment itself. Mhesvi was, first of all, a vehicle carrying and spreading a deadly passenger, a nyongororo (parasite) that vachema (white people) would later call a "trypanosome." This mobility of pest and human turned the forest land into an "open laboratory producing knowledge," as Mavhunga puts it. The generative value of mobility as a site for and influence on knowledge production is a theme within Mavhunga's larger body of work. His first book, "Transient Workspaces: Technologies of Everyday Innovation in Zimbabwe" (MIT Press, 2014), looked at African hunting as a practice through which African science, technology, and innovation could be generated. Much of "The Mobile Workshop" details the strategic deployment of mobility among the diverse tactics Africans developed to combat mhesvi. These methods had adverse social consequences when adopted by Europeans, whose practice of "prophylactic resettlement" forcibly relocated Africans to the mhesvi-infested margins of land, while they settled on lands vatema (black people) had made healthy and livable. "There is a contrast in environmental philosophy I wanted to highlight," Mavhunga says. The African approach centered on "strategic deployments within the environment," as Mavhunga puts it in the book, including "careful siting of settlements, avoiding the potentially pestiferous insect's territory." But the Europeans, he adds, were intent on "destroying species they designated vermin beings, and by any means necessary—slaughtering the host and food source animals, massacring whole forests, poisoning the environment with deadly pesticides whose environmental pollution consequences we are yet to study and understand, including possible links to cancers." As Mavhunga details, cancer rates in Zimbabwe have risen significantly in recent decades, following the use of pesticides—but much of the outside analysis of local health trends has focused on "lifestyle" choices by Africans, rather than environmental factors. Other scholars of African science say the book is an important contribution to the field. Ron Eglash, a professor in the Department of Science and Technology Studies at Rensselaer Polytechnic Institute, has called it "a sophisticated sociological analysis, and a unique account of Africa's relations between knowledge, science, nature, and politics." In addition to highlighting the robustness of African scientific knowledge and its place in the matrix of European solutions to the tsetse fly, Mavhunga's book extensively deploys rich indigenous vocabularies, of vedzimbahwe and others across southern and eastern Africa, to help reconstruct this historical episode through the minds and languages of Africans. In addition to mhesvi and ruzivo, readers can learn the terms for everything from ngongoni (wildebeest) to tsika (culture or custom). It is all part of Mavhunga's project of demonstrating the extent and sophistication of African scientific and technological knowledge on its own terms. "To have written this book otherwise was, quite simply, impossible," Mavhunga writes. "I wanted the reader to appreciate how language, deployed as a tool to silence African modes of knowledge, can be mobilized as a tool to recover that same knowledge," Mavhunga says. "In a sense, the book hopes to excite younger scholars—and Africans!—to investigate, imagine, and make science from Africa."